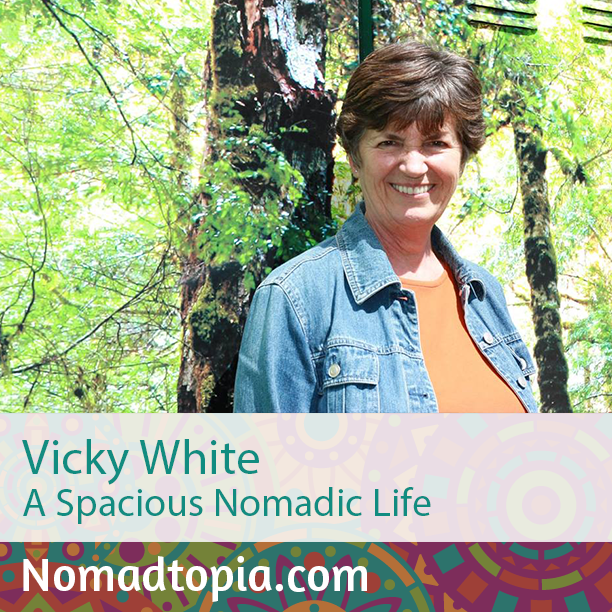 After spending most of her adult life outside her native New Zealand, Vicky moved back in 2014 and is now enjoying a nomadic lifestyle living in a bus and traveling around the country. Along the way she realized she didn’t want to continue her coaching business, and that thanks to her simplified lifestyle she doesn’t need to work right now, giving her even more freedom. I think my most memorable experience was a six-week adventure I had just recently in the North Island, where most of my friends are. I parked up in friends’ yards, stayed at fabulous beaches and had other friends drive fairly long distances to come see me where I was. Felt like the perfect mix of connecting, alone time and exploring hot springs! That’s freedom to me. Returning to NZ shook everything up. I was surprised to find I’m no longer interested in my coaching business. I’m also sort of surprised at how well everything has flowed for me since returning to live in NZ. Great show, and I could really relate to Vicky saying she was tired, at 65, of continuing to push her business. I’m the same age and have been saying the same thing. It made me feel better to hear her say it, too. I was incredibly gung-ho in my 50’s and built a nice little business, but now I’d like to relax more and enjoy life. Doing all the online stuff I know it takes to grown my brand is just not as exciting to me as it was in the past. But who knows, maybe when I get to Mexico, I’ll feel differently. Amy, I love hearing about the different ways to budget and keep track of expenses so I don’t get myself in trouble. I’ve always been pretty frugal, and never got myself in trouble, even though I couldn’t stick with keeping track of my expenses, but very expensive dental bills in the last 2 years have really eroded my cushion. I’m going to need to to get my act together and watch what I spend, so any apps, or easy software programs are of interest to me. Also ways to keep track of my customers orders would be good, too. Thanks for this great service you are providing! I’m glad to hear Vicky’s experience is one you can relate to, Virginia. I think there are seasons for everything in each of our lives, where one thing takes priority over other things. It’s good to follow the flow! I think I talked quite a bit with Erin McNeaney about budgeting on that episode of the podcast—she and her partner, Simon, developed the iOS app Trail Wallet, which is great for budgeting especially while traveling. I have explored a lot of different options over the years, and these days I use YNAB (You Need a Budget) for both personal and business (a separate budget for each) and also use Xero for more detailed tracking and reporting of the business stuff. Wow, thanks so much for these, Amy! I am definitely going to check them out!